CHRISTMAS MAGIC IS SILENT. YOU DONT HEAR IT ~ YOU FEEL IT. - ProudMummy.com the Web's Community for Mums. Home » Memes » Travel & Holidays » CHRISTMAS MAGIC IS SILENT. YOU DONT HEAR IT ~ YOU FEEL IT. CHRISTMAS MAGIC IS SILENT. YOU DONT HEAR IT ~ YOU FEEL IT. CHRISTMAS MAGIC IS SILENT. 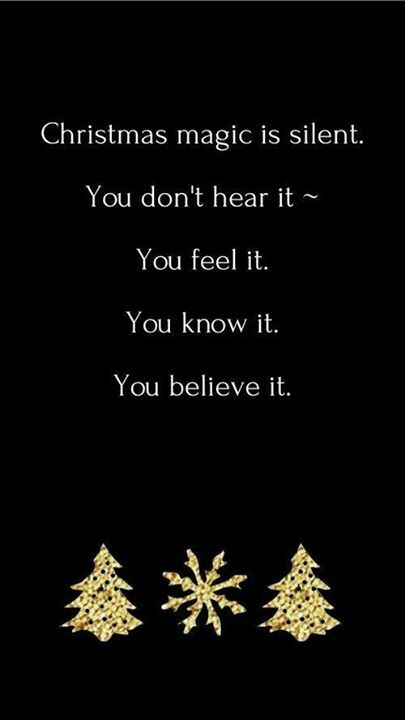 YOU DON'T HEAR IT ~ YOU FEEL IT. YOU KNOW IT. YOU BELIEVE IT.